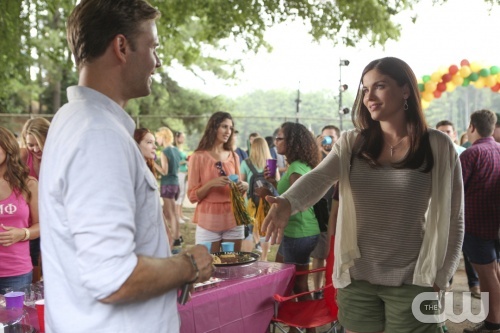 Colin Ferguson, Emily Chang, and Jodi Lyn O’Keefe are three of the main new cast members who will be introduced on The Vampire Diaries season 6, which is set to premiere on Thursday night. Ferguson, who is best known for playing Sheriff Jack Carter on Eureka, will be Tripp, a father figure to Matt. “He came about because we wanted to show Matt thriving in Mystic Falls, without supernaturals,”executive producer Caroline Dries told Access Hollywood. Chang, who has recently appeared on Days of Our Lives, How I Met Your Mother, and Community, plays Ivy, a new love interest for Stefan Salvatore. “Ivy’s a potential love interest, and she kind of opens the door into this world of Stefan’s that we’ve never seen before,” Dries said. “We start to understand [Stefan’s] process as a vampire … of starting over and living a different identity, because we’ve only seen him as Stefan Salvatore, high school student-turned-Elena’s boyfriend,” she added to The Hollywood Reporter. And O’Keefe, perhaps best known for playing Gretchen Morgan on Prison Break, plays Jo, a love interest for Alaric. Dries has added recently that the love stories–Damon and Elena, Stefan and Caroline, and others–will be kept alive. “I can tease that we definitely keep the love stories alive,” she told HitFix. And she revealed a bit about the new bad guy. “He is just like a crazy person and he’s super-fun to write and the actor’s name is Chris Wood,” Dries said.